and wish your baby happy growth. We know that babies grow faster and we design this blanket size to allow the baby to have enough space activity. contact with nature and make friends with small animals. We designed this baby milestone blanket based on this. If for any reason, you are not satisfied with our blanket, all you need to do is let us know and we will make it right for you. ♥HAPPY MEMORIES:A milestone blanket records the baby's growth and makes it a beautiful way for you to remember. Help send baby pictures to social media on precious souvenirs in the coming months. ♥SPECIAL MATERIAL：Made of high-quality flannel fleece, let baby feel comfortable. When taking pictures, flat and smooth blankets will make your baby look more adorable. ♥PERFECT GIFT：The unique baby shower gift can make you stand out among friends and relatives. Your most sincere wishes are the perfect gift for new mothers and newborns. ♥ENOUGH SIZE：Are you worried that the baby will grow too fast so the size of the blanket is not appropriate? 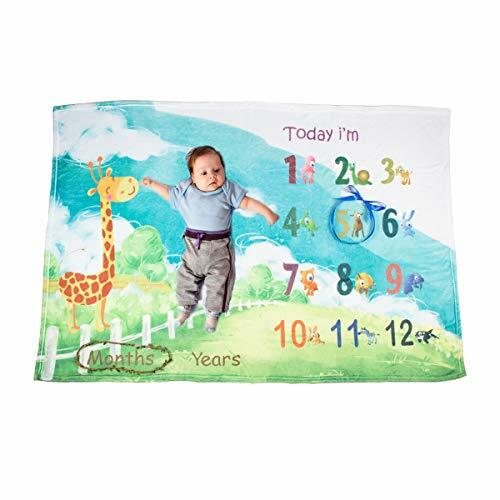 Our blankets are large and 40x60 inches long enough to record the baby's growth before the age of two. ♥INTIMATE SERVICE：At the same time, we also provided a blue ribbon and a vine leaves, which can help you to record time more quickly and make the photos more beautiful. View More In Toddler Bedding. If you have any questions about this product by Ghome, contact us by completing and submitting the form below. If you are looking for a specif part number, please include it with your message. Bearington Baby Lil' Teddy Cuddle Me Sleeper, Tan Teddy Bear Large Size Security Blanket, 28.5" x 28.5"